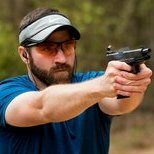 gdcguns - Brian Enos's Forums... Maku mozo! I have built both a 8.5" and a 16" AR40 PCC. Never shot either one over a chrono because I shoot factory ammo. If I can, I'll try and make it out to the range this week and get some chrono readings for both uppers. I'll post them here. Nitro, I would pull out your firing pin and spring and check that neither of them are broken. I have this same deformation on all my glock mags that are used in my PCC. Like others have said, I just press it back straight and keep shooting. Haven't seen it cause any significant issues. I use Adidas Acadia trail running shoes. I think they changed the name to Rockadia now. They have a very aggressive tread pattern and they're only about $50 at Academy stores. Whatever works, at least you have some kind of backup aiming device. I don't have lasers on any of my guns, but I think it would take me longer to hunt for that dot on a distant target than to use my sights. Probably a great option up close though. To each their own. I have backup/flip up irons on my PCC. Even if it is just a game gun, who wants to throw away a stage or a match because their red dot fails? Not me, that's for sure. I have seen a lot of red dots fail, from cheap ones all the way up to $600 aimpoints. Is it life or death? No. But a set of Magpul BUIS don't add enough weight to be concerned about and are cheap insurance that could save your stage or match. Especially if it's a bigger match or one you had to travel very far to attend. PCC or magwell adapter for 2011 mags? I spoke with mech tech about this last year and they had some uppers available that would fit the 2011 platform. If the mech tech interests you at all, you could try calling them. I own a few. The first one I bought was a Just Right carbine. Mine works pretty well, with only the occasional malfunction, but I have a few friends who also bought one and have more frequent issues. I also have an AR pistol and a carbine that I built from parts. I had to do some work to get the pistol to run in the beginning. It's good to go now though. The carbine has been pretty good from the start. They all use glock mags. I tried one of the longer ETS mags. It's a no-go for all of them, the round always comes out too high and jams into the top of the barrel extension. So you might wanna steer clear of those for 40 cal. Any reason to use a bolt catch? For my build I used a KE Arms lower. It doesn't have any LRBHO. I still installed a bolt catch for the reasons mentioned above. You shouldn't have any problems with it breaking because you'll only be using it manually. They break when they try to stop the heavy buffer and bolt that has a good running head start. Like Eric said, download one of your bigger mags a few rounds until you can seat it on a closed bolt. Start with 41 rds and plan your reload somewhere along the way before you run dry. And a few extra mags on your belt are always a good idea. You never know what can go wrong during the stage and I think it's better to have them just in case. I use the VLTOR E-mod. It's what I have on my 3-gun rifle so I wanted to keep things the same on my PCC build. If it's not ejecting the spent case then it sounds like either your extractor or ejector or their springs. I would check those first. So this same gun runs fine with the same mags, but a different bullet?